Roll-up sides and drop-down curtains are low-cost vent systems that can be installed in most high tunnels. These systems operate on the principle that heat is removed by a pressure difference created by wind gradients, so no energy is required to operate fans to move air. A wind speed of 2-3 miles per hour is adequate to force cool air in the windward sidewall. The air traveling over the high tunnel creates a vacuum on the leeward side to pull the heated air out. In both systems, a rail, either wood or metal extrusion, is attached to the high tunnel frame 3’ to 5’ above the base board. Rails are usually attached on both sides of the high tunnel to allow for cross ventilation. The plastic over the top of the high tunnel is attached to the rail to form a seal for air inflation. In roll-up systems, the remaining material becomes the vent. The bottom of the plastic is attached to a piece of steel tubing with clips or batten strip. A two-piece roll bar that clamps the plastic is available from Advancing Alternatives, Inc., Schuylkill Haven, PA. To open the vent, the tubing is rolled up with a hand crank or vent motor. Opening the vent introduces cool air at the bottom which may or may not be desirable depending on the placement of the crop in the high tunnel. In drop down systems, cool air is introduced at the top of the curtain allowing it to moderate before it reaches the plants. The bottom of the curtain wall material is attached to the baseboard with a batten or aluminum extrusion and the top is attached to the steel tubing. The curtain is lowered or raised by a system of cables and pulleys that are attached to a either a manual or motorized winch. A separate sheet of plastic is frequently used for the curtain. This material can be a 4-year copolymer film or it can be a heavier material such as a reinforced polyethylene or polyvinyl. Another drop down system utilizing inflated poly tubes is available from Poly-tex, Inc., Castle Rock, MN. The poly tubes, held in place along the sidewall with retainers, are inflated in two stages by small blowers to provide two levels of ventilation. However, during power outages, the curtain will drop to the open position. Therefore, a back-up generator is needed to handle power interruptions. Roll-up and drop down systems have several advantages over fan systems. Eliminating the fans reduces the electric bill, a nice bonus in a time of increasing rates. Fan cooling for a typical high tunnel operated spring, summer and fall is 8¢ to 10¢ per square foot based on 12¢ per kilowatt hour. During warm weather, the temperature inside the structure can be maintained within a degree or two of outside. Unlike fan ventilation where the temperature at the fan end is 8ºF to 12ºF warmer than the intake end, natural ventilation will provide uniform temperature throughout the high tunnel. The best cooling is achieved where the high tunnel is not obstructed by other buildings and is orientated to receive the summer breeze. Opening the sidewall allows easy accessibility for moving plants into or out of the high tunnel. There is a reduction in noise if fans are not used. Air leaks can be a problem, especially on windy days. There are systems that reduce infiltration including (a) installing plastic over the first frame on each end to form a seal, (b) attaching Velcro to the outside frames and an adhesive backed felt strip to the plastic, (c) inflating a polytube attached to the end frames and (d) installing a curtain pocket. To seal the bottom of a roll-up system, the bottom of the curtain can be lowered onto a shelf made of wood or metal that seals along the entire length. A continuous extrusion manufactured by Advancing Alternatives, Inc. can be installed to fully seal the bottom of the curtain. On drop-down systems the curtain is drawn up into a pocket or hood that sheds rain and snow and forms a tight seal. 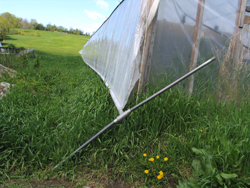 To keep the curtains from billowing out in the wind, a retainer is needed along the side of the high tunnel. It needs to be firmly attached at the rail and baseboard as there is considerable pressure built up on the curtain in a heavy wind. Several methods are used. Retainer clips attached at the rail and baseboard allow nylon or polypropylene cord to be laced in a zig-zag pattern. Curtain brackets made from 1” conduit or tubing placed at 4’ to 5’ intervals make a permanent installation and allow easy access through the wall for materials handling. Polypropylene strapping, 2” to 4” wide, attached vertically every 4’ to 6’, gives good support and reduces wear on the curtain. Some growers have installed a double layer of poly curtain and inflated it to reduce heat loss. This also reduces the rippling effect of a single layer material and the associated wear. The simplest method for opening a roll-up curtain is a hand crank. Adding a universal joint allows the crank to be operated in any position. To reduce the job of raising long, heavy curtains, a gearbox assembly that rides on tubing or a rail can be used. Usually the gearbox has a ratio of 10 to 1 or 15 to 1. Operation of the gearbox can be either manually with a crank or powered with a battery-operated drill. Motorized gearboxes and tube motors are available that can be controlled by thermostats, humidistats, timers or a controller. Cost is around $1000. Limit switches that provide stops at the top and bottom are needed. Drop down curtains are frequently operated with a winch. A series of vertical support cables are attached to the tubing in the top edge of the curtain. The usual spacing is at least one foot more than the height of the curtain. The other end of each cable is drawn through a pulley and then clamped to a main control cable. The main cable is supported by pulleys at each end. One end of the main cable is attached to the winch. A counterweight is attached to the far end to maintain tension and to lower the curtain evenly. The cables, clamps and pulleys should be stainless steel to have trouble free operation. The size of the winch is determined by the length of the curtain. One with two-way operation is desirable. Electric winches allow automatic ventilation. They are available in 120-volt and 12-volt models. Limit switches and a thermostat are needed. 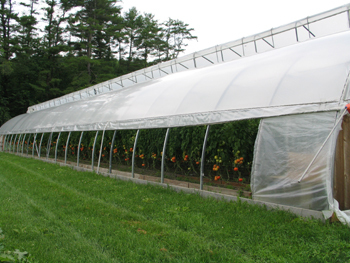 Growers with high tunnels have found that roll-up and drop down curtain systems work well for warm season ventilation. A location with good summer breezes and plenty of space between tunnels will allow the temperature to remain within a degree or two of outside. The curtains need to have a tight seal if the high tunnel will be heated during the winter.